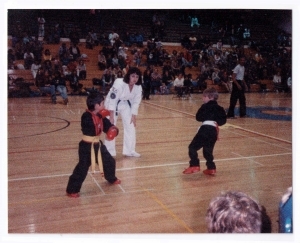 When I was young, I used to LOVE to compete in martial art tournaments! My favorite thing to compete in was point sparring. This was back in the day when you weren’t required to wear head gear in a point sparring match (I miss those days). 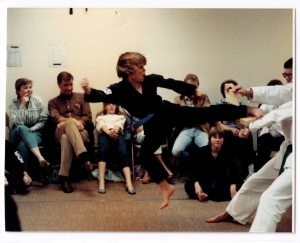 For your enjoyment, I have included a picture of me in one of my very first tournaments (I’m the white belt on the right – pay no mind to the shaggy, bowl cut). I have some of the best memories from competing in the Boulder Nationals Tournament in the mid-1980’s. Richard’s first tournament as a new white belt, age 6. They could wear hand and feet gear but no head gear! 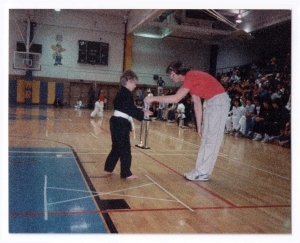 One year I remember placing 1st in the point sparring division for my age and receiving a trophy that I felt taller than I was. That was by far the coolest trophy I have ever won! These tournaments were where we got to watch men and women compete at a high level in their various specialties and get a glimpse at what kind of martial artists we wanted to be. Men like “Baby Face” who always would win the Grand Champion prize in the point sparring division (he was a maniac). Men like “Robot” who could do anything with his Kamas (weapon) and would amaze us with his original forms (he won everything). I also think it is funny how I only remember their nick-names (I don’t think I ever knew their real names). 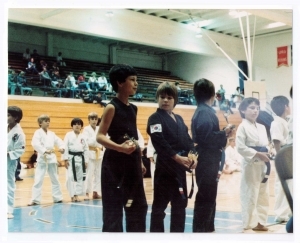 Competition became a huge part of my martial art journey. I am so grateful that I had the chance to compete in so many kinds of tournaments – from ITF Point Sparring Tournaments to USTA Junior Olympic Style Tournaments. Because of these experiences in competition, I learned how to get up after I was beat or hurt (from the sprained ankles, the fractured feet, the bumps and bruises, a few broken noses, and that dang torn ACL). I learned how to win graciously, I learned how to work and train with a team (James Earl Jones’ voice comes to mind from the movie “Best of the Best” — saying, “A Team is not a Team if you don’t give a d*** about one another” – sorry for the swear word). I learned how to keep fighting even when the odds in the match seemed impossible, and I learned how to perform martial arts while trying to manage the nerves and adrenaline that come with competing against others. Testing, or belt progression, is another way martial artists face themselves. When compared to Tournaments, Testing produces a different kind of nervousness. Instead of being in an arena where the martial artist is competing against someone else, testing is a time where it is “you against you”. 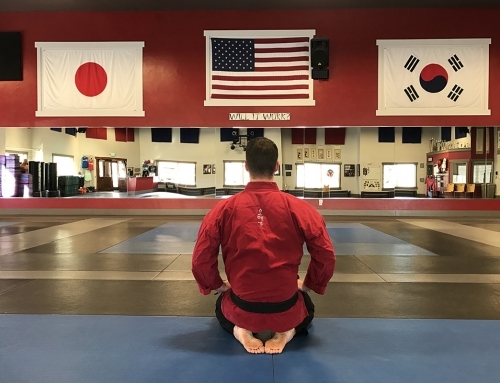 For some students, testing can be even more scary than competing in a tournament, and I see a lot of students who would prefer to just compete and not have to worry about belt progression. Let me explain the core principles of why we need to progress and be willing to Test. Like competing in Tournaments, I used to love to Test! Maybe it is the performer in me, but I would love it when I could show myself and the judges what I am capable of doing when everything is on the line. Sometimes I would mess up and I even did not pass a test one time, but I never shied away from putting myself out there. There is an absolute need in the process of growth and progression to be held accountable by testing us on the knowledge and skills we have been taught. Through testing we are able to realize which mental and physical skills we are able to immediately recall when we are faced with nerves and adrenaline. We then realize where we are on that process and we learn what we need to work on to become better. Sometimes in martial arts (especially in kids) there is too much emphasis placed on “getting the new belt” though. So, why do we now have this elaborate belting system that is so much a part of the martial art experience? In my opinion, there is a value that the modern day martial art belting system plays. Testing for, and receiving new belts, is an extrinsic representation of a martial artist’s upward climb towards greatness (black belt). Just as greatness is never one single destination, neither is black belt. Being a black belt is a culmination of many triumphs and accomplishments that happen over to course of a long period of time. 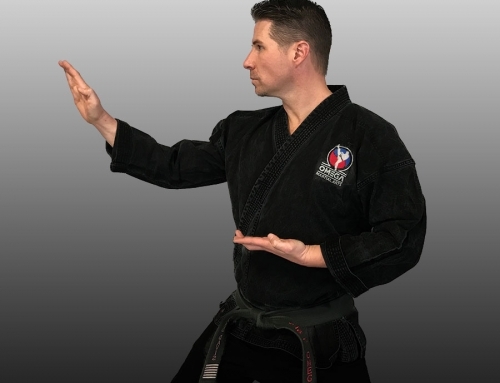 These smaller culminating points can be outwardly seen through achieving white belt, yellow belt, green belt, purple belt, blue belt, red belt, and then black belt. We then teach the student that black belt is just another beginning towards further growth and progression. 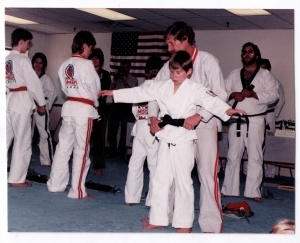 Richard receiving his Black Belt! 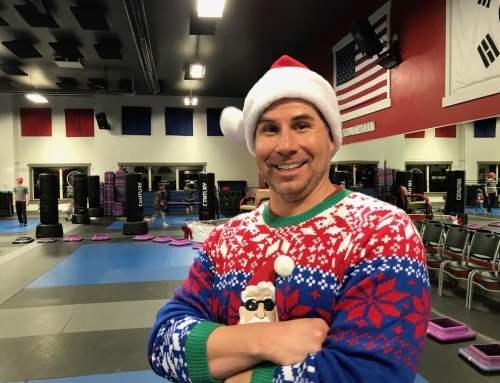 Whether you are competing in a Tournament or trying to progress to the next belt level through Testing, there will always be nerves and adrenaline. If we just remember that these opportunities are there for a purpose; they are there to help you learn and progress. Just as we are all unique individuals and martial artists, the lessons we learn will be unique to us personally. Another thing to remember is that these learning experiences are meant to be hard. If there is no resistance then there is no growth. As we learn to face Tournaments and Testings with an attitude of growth, we will look at challenges in our everyday life differently, and we may one day even be grateful for them. Sign me up for Kwanjangnim's Korner!